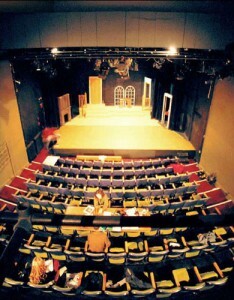 The Alumnae MainStage is a traditional black box theatre, fully air-conditioned with 140 seats. Rentals include lighting and sound equipment, use of the dressing rooms and lobby and box office. Stage dimensions are 32.5′ wide, 28′ deep and 16’2″ to grid. Box office/technical staff are not included. Please note: The depth of the stage is 28′ from the front of the stage to the back wall. However, we offer a full sych which provides a convenient upstage cross for the actors; with it the depth of the stage is reduced to approximately 25′.